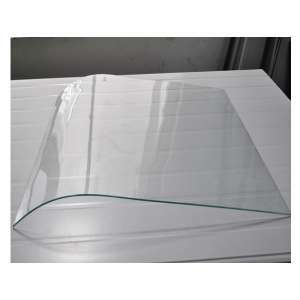 Variable curvature curved tempered glass, also known as unequal arc curved tempered glass. As the name suggests, it is different from the curved tempered glass with the same radius of the common curved edge. It belongs to a special type of curved tempered glass, which is also a kind of safety glass. The entire tempering process of the glass is completed in a tempering furnace. The unequal arc curved tempered glass means that the original piece of glass is heated by the heating furnace. Then transported to the forming tempering section. The glass is bent into a “J”, “S” or “U” type curvature. After that, blown by the wind ridge between the roller tables. Tempering, cooling. The unequal arc curved tempered glass is completed in an unequal arc curved glass tempering furnace. The surface of the tempered glass forms a uniform compressive stress, while the inside forms a tensile stress. It improves the bending and impact strength of the glass. And its strength is about four times that of ordinary annealed glass. 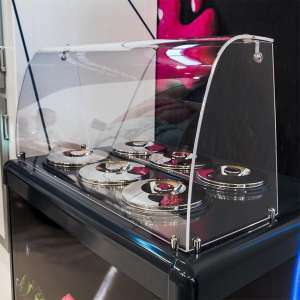 The tempered glass that has been tempered can no longer be processed or damaged by any cutting, grinding, etc. Otherwise it will “break the bones” due to the damage of uniform compressive stress. 1. Increasing strength: After tempering, the mechanical strength, impact resistance and flexural strength of the glass can reach 4-5 times that of ordinary glass. 2. Improvement of thermal stability: Tempered glass can generally withstand temperature changes of more than 250 degrees, and has obvious effects on preventing thermal cracking. The resistance to variable temperature difference is three times that of ordinary float glass of the same thickness. 3. Improving safety: After the tempered glass is damaged, it will quickly show tiny obtuse-angle particles, thus maximizing personal safety. Commercial refrigerators, food display cabinets, high-end buses and construction fields etc.